When should you use a sheet membrane instead of a liquid membrane? Or when should you use a liquid membrane instead of a sheet membrane? This has been coming up more and more in discussions with our team, customers and resellers out in the marketplace, plus the designers and specifiers. With sheet membranes, there are now systems like our GC system, which is becoming more and more popular in the marketplace. Particularly for wet area applications because you don't have the heavy torch-on membrane system. It's not a butynol rubber. 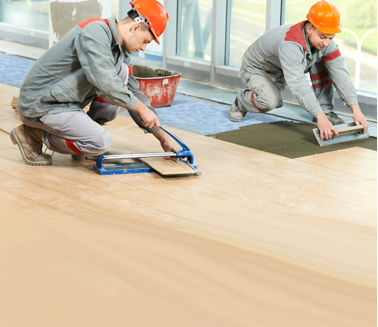 We’ve got the GC sheet that bonds well to substrates and allows the flooring systems to be bonded well over that, there are no adhesion issues at all. And when do you use that sort of system instead of a liquid membrane? The advantages of a sheet membrane firstly are that you've got a uniform sheet. It's a factory-made product and you've got uniform thickness, so you don't have any risk that there could be any indifferences between the film thickness of the membrane. Secondly, it's not as elastic as a liquid membrane, but it's far higher in strength. So when you've got situations where you might have a concrete slab that could have hairline cracks in it, the sheet system of the GC is insurance that you're going to ensure that you've taken care of those cracks and none of that fracture is going to come through the liquid membrane, through the top to the tiling system. So that sheet acts as an anti-fracture system as well Thirdly, it's the time. You do sheet systems far quicker because there's no coming back to do the second cut, or the third cut if need be, it's done and dusted. The other part of it is, it just gives you that extra reinforcement, it gives you that high build. Now sometimes I've seen applicators use a liquid membrane, they see some spider cracking on concrete and they go and reinforce the liquid membrane with a mesh. A fibre glass, a reinforcing fabric, like our Gripset RF, it makes no sense to use an elastomeric membrane with a reinforcement layer you've taken all those properties out of there. So, the smart thing to do is to use a sheet in that situation, over the liquid and that's done. Now, when would you use the liquid over the sheet? Well sometimes it comes to budget and cost, and the type of application, and there's nothing to say that our liquid membranes can't be used where a sheet is, but you've got to understand that there are situations where there are limitations. Sometimes applicators will go to major extremes because they're concerned with their liquid membrane about certain cracks and certain joints on the substrate. And at the end of the day they could've done it a lot quicker with a sheet system at a much better quality. You need to understand that there may be situations where the sheet system is far quicker. Your time is more important than the cost of the materials. You need to use high quality waterproofing systems because your time is what will make you profit and enhances your reputation. So understand that there's a time and a place for a liquid system and the beauty of the GC range is that you can incorporate the liquid and the sheet together, you don't just have to go with one, there's no welding, there's no heating, it's a cold application. For example, there are certain balconies where the GC sheet may be used and there are others where the liquid membrane, like our Gripset 38FC, would be used. Where we're seeing more commonly the two systems being used together is when we specify again with an over and under system. So the GC sheet gets used on the base layer of the surface as a waterproof, it then gets screeded on top and then the liquid membrane goes on top of that screed as a finish surface before tiling, or it could go the other way around, but that is our preferred method and it makes really good sense. If you've got questions about when you should use a sheet over liquid, you've always got our data sheets which list advantages and the features of all our products. It’s time to talk about waterproofing at the..
We're going to talk about vapour block primers..
Modular building is going to disrupt the const.. Reinforcing Fabric vs Elastoproof Joint Band – What’s the difference? Today I'm going to talk about Gripset RF Fabri..
Gripset GC1 is an innovative sheet membrane system, providing high performance waterproof and vapour barrier protection in the built environment.